Crick and others firmly believed about the idea of a primitive RNA world or RNA as genetic material or master molecule before the takeover by DNA. But the major question who did the function of proteins (the catalytic function)? The discovery of ribozymes further supports ‘RNA world’ that is RNA can do the function of protein or catalysis. The catalytic ability of RNA may be later passed on to the proteins. The reason for catalytic activity in RNA may be due to the presence of 2’ OH group where in DNA it is 2’H. Discoverer: Thomas Cech et al in 1983. The formation of peptide bonds during synthesis of polypeptide chains (peptidyl transferase). 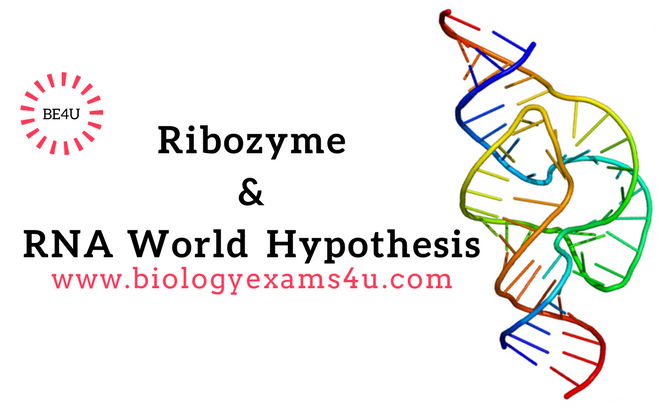 Disadvantage: Ribozymes are easily degraded inside the body by various enzymes. So ribozymes are encapsulated in liposomes and is introduced into the body.